Well today I’m showing you another example, but this time it’s a loser! It’s actually my most recent losing trade too. I mentioned in the previous example that winning trades come along more than 65% of the time, so, as breakevens are quite rare, the losers appear less than 35% of the time. 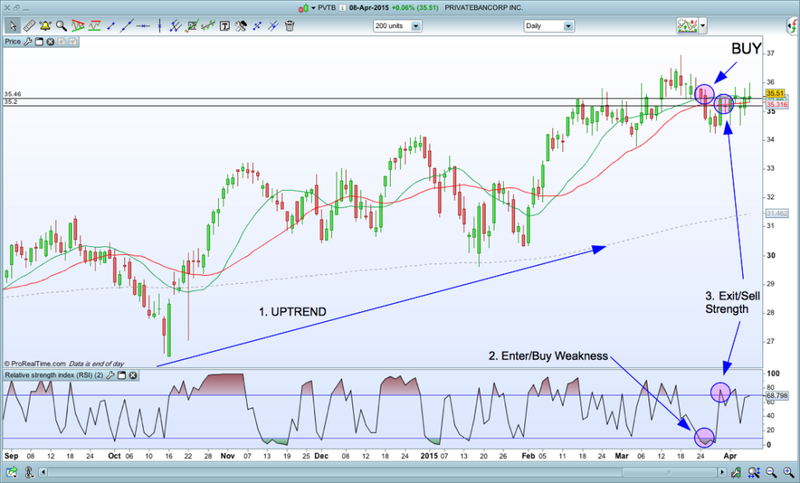 Oversold – I get a Buy Trigger when prices become short term oversold. I place a limit order to enter the next day at the closing price of trigger day (shown by the upper horizontal line on the price chart above). Overbought – Prices continued to fall after I entered, becoming even more oversold. Prices rarely hit my wide stop loss. But I’m looking to exit into strength. After a powerful up bar, I see RSI has become oversold and I enter at the open the next day (shown by the lower horizontal line on the price chart above). I am very happy with this trade even though I lost money. I have rules and I traded them perfectly. I would take this trade again any day. No regrets. That it what having a rule based strategy is all about. My strategies are robust and are completely suited to my personality. I will never analyse a losing trade and get upset about exiting too early, not exiting early enough, leaving money on the table etc. What I look for is efficiency in myself as a trader – have I traded to the rules of my strategy or not? If I have, then great. If I haven’t, I’ll go to work on myself, improving my efficiency. So there you have an example of a losing trade within one of my strategies that have a positive expectancy. A positive expectancy means that over a large enough number of trades taken, after all the losers are deducted from the winners, it is profitable. I hope you enjoyed this quick insight and remember to check out the previous winning example here.